West coast swing: Las Vegas Motor Speedway; ISM Raceway (Phoenix, AZ); Auto Club Speedway (Fontana, CA). Drivers include: Jimmie Johnson; Chase Elliott; William Byron; Alex Bowman. 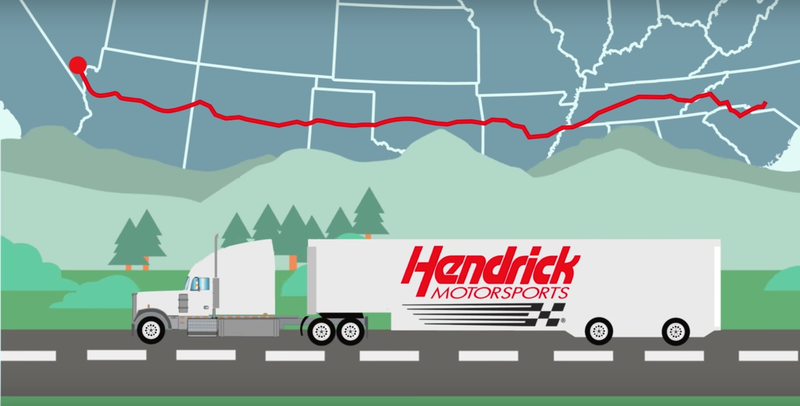 Watch the video below as Hendrick Motorsports details hauling NASCAR race cars across the country. In total, 6 haulers set out for the first west coast race in Las Vegas. Those haulers carry the 4 Las Vegas primary cars and the 4 Phoenix primary cars. When the Las Vegas race is over, two of those haulers load the 4 Las Vegas cars and head back to North Carolina as the race haulers head to Phoenix. As soon as the swap haulers reach North Carolina they are loaded with cars for Fontana. On the road again, they head to Phoenix to grab those cars and drop off the cars for Fontana. In total, this back and fourth driving totals 38,420 miles between all 6 haulers during a 3 week period of time. Those hauler drivers make 10 round-trip stops from the east coast to the west coast and back to the east coast again. Some teams in the garage area take it a step further. Joe Gibbs Racing actually has a west coast headquarters and an undisclosed secret location. That shop is used to work on race cars and prep them for the following west coast race. However, the team still uses the same swap hauler theory despite having a west coast base.